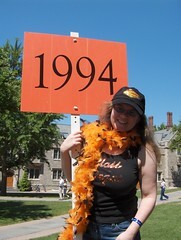 Princeton, New Jersey, every year - Yep, every year Sue and I head back to college to Reunions! It's three days of dancing, drinking, and outrageous outfits - there's even lectures to go to if you wish. It's the full college experience... No, scratch that - it's Freshman Week all over again. Only with more children. This year is my 15th, after all. I drive down tomorrow morning - hooray! I'll get around to posting a few words and a couple of pictures once I recover. Hopefully that'll be by July.